Have you seen the Spielberg movie Lincoln? It brought to light all the backroom deals that were cut to free the slaves and establish the Emancipation Proclamation of 1863. While our country is still divided in many ways today, we all experience moments of liberation and unity. One such experience was shared by the 175 people who packed the Riverview Missionary Baptist Church in Kingston last Saturday evening. I believe that all music is political. When music goes beyond beautiful sounds and exciting rhythm, it can transform us and move us toward a greater commitment to our ideals. 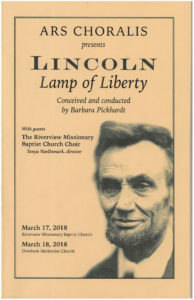 The Ars Coralis concert, entitled “Lincoln: Lamp of Liberty,” was presented in conjunction with the church choir and told the story of the time surrounding the Civil War, using speeches of Lincoln, music of the period and some contemporary works. The concert was the creation of the director of Ars Choralis, Barbara Pickhardt, who is known for creative programming. Joining Ars Choralis on the program were the 13 members of the Riverview Missionary Baptist Church Choir, known as Instruments of Praise, led by Tonya VanDemark. A small arsenal of instrumentalists, narration and fiddling by Gilles Malkine, and some photographic projections, mostly from the late 19th century, were also a part of the concert. There were many wonderful soloists, with standout performances by Jim Noecker and Marjorie Knox. Lincoln was known for crying publicly when moved deeply by music. There were many moments in this production when I am sure Lincoln would have been weeping with joy as many of us were. Those moments included a beautiful arrangement by Pickhardt of “Deep River,” the church choir’s moving performance of “I am Free,” and the joint performance of “We are One.” This wonderful concert was a reminder of the power of music to inspire, enlighten and remind us of our shared humanity.